Hot 50 Nominations 2019 now open! 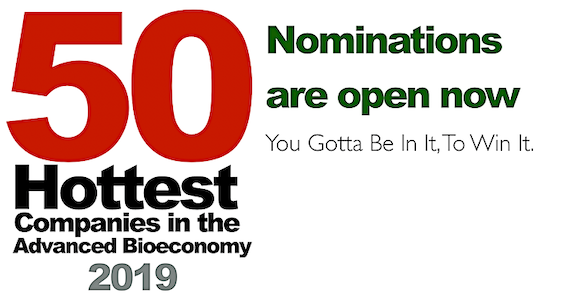 In Florida, The Digest announced the official opening of nominations for the 50 Hottest Companies in the Advanced Bioeconomy for 2019. Nominate companies here. This year, votes will be weighted as follows: 40% based on votes received from the invited Panel of Selectors; 40 percent based on votes received from registered subscribers of The Digest, and 20 percent based on Photo Votes. Each company or organization that receives a nomination will be included on the ballot, along with last years’ Hot 50 recipients. Nominations will remain open through Friday February 1st at 5pm ET. Note: No company has yet made it into the Hot 50 as a write-in. So, nomination is virtually essential for a good result — “you have to be in it to win it,’ so make sure you nominate the companies you are a fan of. Any company engaged in the advanced bioeconomy as a producer, supplier, investor or partner is eligible for the Hot 50. Hot 50 voting will begin February 11, 2019 and continue through March 15th, 2019 at 5pm ET. Hot 50 rankings will be announced at ABLC in Washington DC on April 4th, 2018 at 630pm ET, and we will honor the companies, their suppliers, industrial partners, investors and team at the annual Hot Party in Washington DC. Selectors will receive their official Hot 50 ballots from The Digest during the week of February 18, 2018 and must return them via email no later than 5pm ET, Friday, March 15, 2018. For the Hot 50, subscribers will receive a link to their official ballot in each e-mail newsletter issue of The Digest published between February 11, 2019 through March 15, 2019. Photo Votes will be distributed on the Digest’s Twitter and LinkedIn networks (subject to review for taste and originality) and each Like for each photo vote counts for 1 additional vote in the Hot 50. The photo must be an original creative work — substantially created for the competition — and must contain the name of the company you are voting for and the words “Hot 50”. Repetitive photos (e.g. a photo of every employee in the company, holding a “Hot 50” sign), will not be counted. The Digest retains the right to reject any photo on the grounds of lack of originality — e.g. repetitive photos for the same company, images that are from the public domain simply with a “Hot 50” inserted. Images from the public domain can be used if they are used as a springboard for an original creative effort representing an original idea. PhotoVotes are unlimited in number, and can come from one person — if you submit ballot vote, you can still submit PhotoVotes. The most original PhotoVotes of the Week will count for 100 votes — the Digest will determine the number of awards given each week, based on the flow and quality of submissions. All companies that registered for the Hot 50 Rankings are included in the Official Ballot, but if there is a deserving company that did not register for the Official Ballot, voters are welcome to cast a write-in vote for that company. Voters may not attempt to spam the ballot box through deceptive practices, nor may competing companies organize spam balloting efforts. The Digest reserves the right to reject any ballot it deems to be the product of a spamming campaign — or to cancel all ballots from that voter, or remove a company from the competition — and such a determination will be made in the Digest’s sole discretion, and its decision is final. Prohibited voting practices include but are not limited to: creating multiple digital accounts in order to submit multiple ballots; using faked or borrowed digital accounts to submit multiple ballots in violation of daily ballot restrictions; or encouraging potential voters to create, borrow to otherwise use multiple digital accounts in order to submit multiple ballots. In general, any practice designed to prevent a fair ballot is prohibited, and may result in the suspension of a company from the Hot 50 or the cancellation of any and all ballots which the Digest, in its sole discretion, deems to be tainted. Companies or individuals may exhort colleagues, friends or the general public to vote for a deserving company – campaigning for the Hot 50 is not prohibited so long as the voting itself is fair and ethical. Voters are permitted to vote for companies they are personally, directly or indirectly, affiliated with.